If your office needs new desk chairs, turn to the company that businesses in Alpharetta, Woodstock, Sandy Springs, and other Atlanta, GA, areas have trusted for modern and durable seating solutions for years, NorthPoint Office Furniture. At our showroom in Roswell, you’ll be able to see and test the wide array of office chairs we offer and choose the option you find most comfortable for your workspace. We provide chairs from some of the most trusted names in the industry, like HON, Fairfield, La-Z-Boy Contract, and more, so regardless of what you choose, you can be confident that you’re receiving a high-quality chair. The office desk chairs we provide have a number of different features from which you can choose to find the optimal choice for your business or home office. 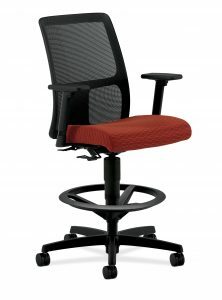 We have chairs with lumbar supports, adjustable arms, headrests, reclining capabilities, and other beneficial features. Our chairs are also made of a variety of different materials as well, including leather, polyester, mesh, and more. When you purchase office furniture, chairs, a file cabinet, or anything else from NorthPoint Office Furniture, we’ll put together everything you order and can even deliver them directly to your office if you so choose. To see the variety of office desk chairs and used office chairs we offer, visit our showroom in Roswell today. We proudly provide office furniture for businesses and homeowners in Alpharetta, Woodstock, Sandy Springs, and the surrounding Atlanta, GA, communities.